Devotionals from Priscilla’s original studies and teaching help you grow closer to God when you run errands, drive to and from work, or pick up the kids. Devotionals from Priscilla’s original studies and teaching help you grow closer to God when you run errands, drive to and from work, or pick up the kids. 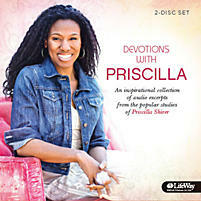 This CD set includes inspiring Scripture-­based lessons that will offer you encouragement during your daily routine.